Yūsha, Fai, Seira and Mei travel to a tropical island during summer break, where their misadventures allow them to complete their summer assignments. When term resumes, Princess Rona Pricipa O’Lapanesta arrives, eager to meet the new hero, and while she’s surprised to learn the new hero is a girl, she nonetheless becomes enamoured with Yūsha after Yūsha helps save Mao from an irate monster. Mao later becomes sick, so Yūsha and her friends go to help look after her. Rona later longs to learn more about Yūsha’s friends, and accompanies Fai on a trip. She also asks Mao to help draw out heroics from Yūsha, but learn that Yūsha’s more concerned with her friends. Later, Mei receives an invitation to attend the Cartado Festival in Tarka Village. Participating in a hunt for Cartado, Mei only manages to find an extraordinarily large Cartado, but ends up winning the competition. 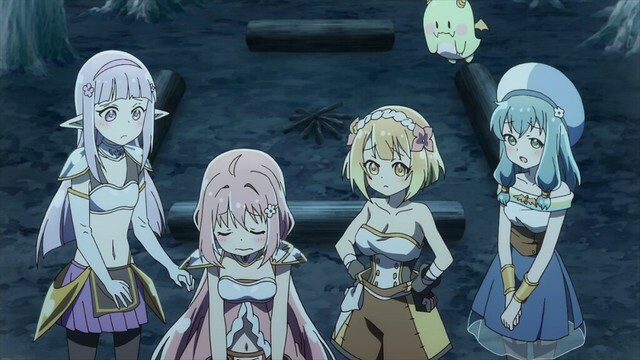 While on a quest in the mountains, the girls are caught up in a snowstorm, and Seira manages to wake everyone up when a Cartado-eating monster puts everyone in a deep sleep. Mao decides to invite Yūsha and the others over for dinner, but her awful cooking ends up being too much for everyone. Even Chibi-chan regurgitates dinner, which includes Mao’s old golem, Meigo. Fearful that Meigo may reveal her identity as the Dæmon Lord, Mao opts to keep an eye on her, but afer Rona uses a Cartado to unlock everyone’s memories and suggests taking Meigo back with her, Mao finally snaps, reveals herself as the Dæmon Lord and kidnaps Rona. The girls manage to track down Mao, but Meigo informs Yūsha that she is close to ending the Dæmon Lord’s power. The girls are conflicted between ending the cycle and being made to kill off Mao, who they’ve come to regard as a friend. In the end, Yūsha refuses to compromise her principles and destroys her sword by having Chibi-chan consume it, while Meigo throws Mao into Chibi-chan’s mouth. It turns out that there’s a pocket dimension inside Chibi-chan, and entry into this space removes an aspect about a character. When Mao is regurgitated, she no longer possesses her Dæmon Lord powers, and everyone is able to continue on their days together in peace. As class begins the next day, Yūsha expresses a desire to be a hero. 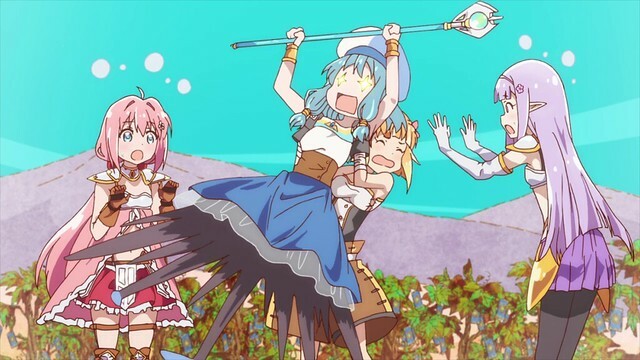 Thus ends Endro!, this season’s unexpected surprise that proved to be consistently entertaining and warm. 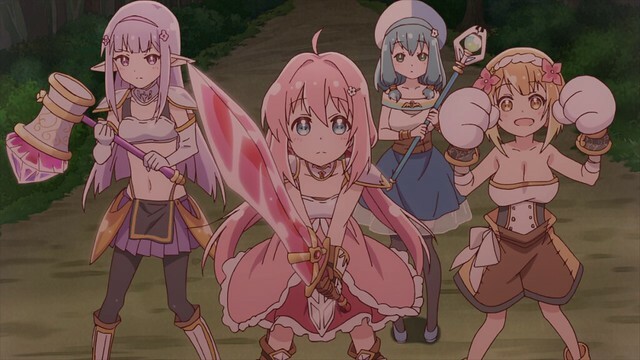 While seemingly an easy-going anime about a group of adventurers, Endro! 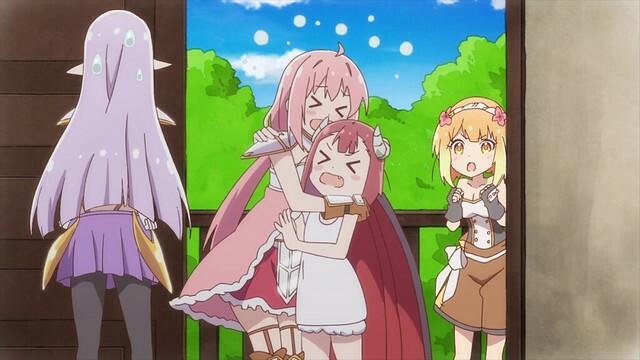 does have a theme that is appropriate and relevant towards the show: underneath the warmth and joy the show projects through Yūsha and her friends’ misadventures, as well as everyday life, Endro! frequently reminds its viewers that for a given problem, there’s always another solution. This much was presented with Yūsha’s first adventure in a dungeon; they might have gotten lost thanks to Mao’s intervention, but by adapting to the situation, manage to locate the Hero Sword and finish their assignment. Fai and Rona similarly win a melon-eating contest when Rona adapts to the situation and helps an engorged Fai eat one melon, propelling them to victory. When Mei participates in the Cartado hunt, her finding a large Cartado ends up allowing her to win the competition, against her expectations. In the final battle, Yūsha refuses to fight, and instead, casts her weapon away – Chibi again comes to play a significant role in helping liberate their world from an ancient curse, having earlier played a role in defeating a lesser evil. Admittedly, Endro! is very optimistic with its messages; finding alternative answers to problems and making the most of things is not a trivial task, although the presence of cheer and joy in a world under the constant threat of annihilation is intended to show that every cloud has a silver lining. 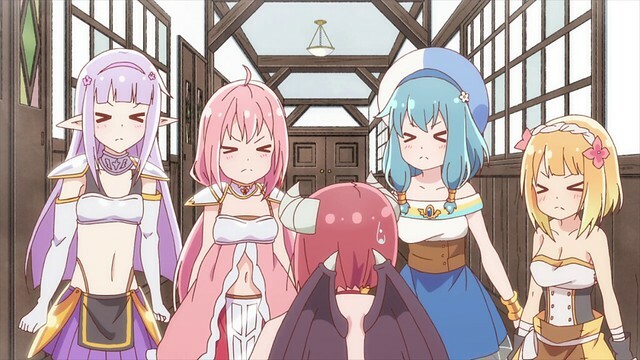 When Endro!‘s conclusion is reached, it is a decisive one, leaving viewers with no doubt that, by simply pushing for other solutions than the ones presented, Yūsha is able to end an age-old curse plaguing Naral Island, paving the way of a peaceful future. It’s a fine ending to a series that was very entertaining and endearing to watch. 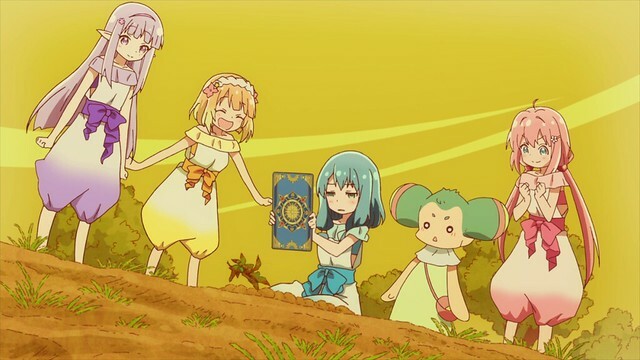 The last time I wrote about Endro!, I had finished three episodes and found myself modestly impressed with how relaxing the show was. 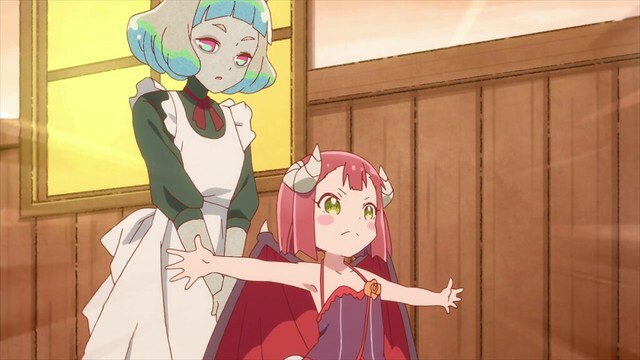 With the rest of the episodes in the books now, this series proved to be a very pleasant surprise, and admittedly, just being able to watch things at my own pace enhanced the experience: Endro! is not the sort of show that demands watching on a timely basis and I ended up watching episodes based on when I had time. 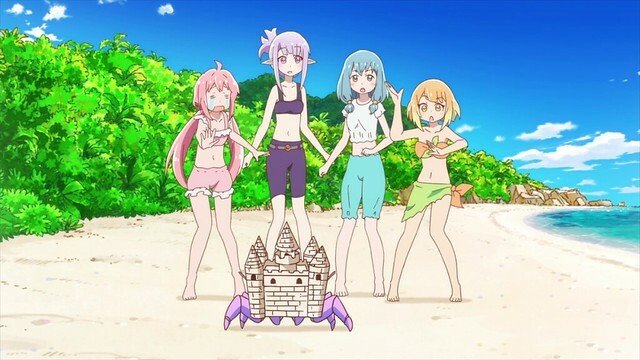 The forth episode is set on the beaches of a tropical island, and after some standard shenanigans, the girls run into Mackerel-people, whose homeland was conquered by an evil god. During their fight, the girls are outmatched, but Yūsha’s status as a hero allows her to destroy the god’s physical form. Reduced to a small but still potent spirit, the god escapes, only to be consumed by Chibi. I realise that for March, I’ve not actually written all that much about anime, either; we are now on the last day of the month, and this weekend also was the last one that one of my friends was back in town. We went to get sushi (I ended up ordering less sushi and had tempura udon, a piping hot takoyaki and even tried salmon sashimi) before playing Carcassonne for the first time. Despite this being my first ever game, I managed to win, having finished a massive city that scored me forty-two points. Yesterday, I started building the MG Dynames that I ordered at the beginning of the month, and finished earlier today. It’s a solid model with a new frame that gives the kit tremendous posability and stability. Princess Rona is of royalty and able to summon considerable amounts of resources to execute her goals: upon learning that Yūsha is the current generation hero, she puts a carnival for Yūsha, and later, comes to love Yūsha deeply for her heroic spirit. Having read about the exploits of past heroes, Rona has encyclopaedic knowledic of the past heroes: the number of similarities she draws between the heroes and their companies of old suggest at the similarities that people inevitably share. When Mao falls ill, Yūsha and the others go to look after her. In the process, the learn that Mao’s place is a bit of a mess, and help her clean up, before cooking her dinner. 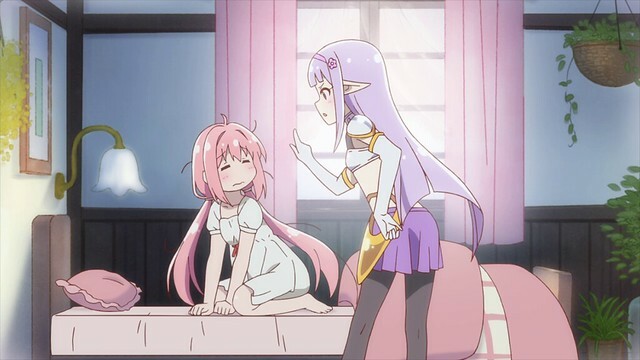 The dynamic between Mao and her students is blurred, and Endro! wastes no time in setting up the recurring joke where Seira’s ability for housework is so poor that the others prohibit her from helping out. Rona’s introduction into Endro! livened things up considerably, and I’m rather fond of her character’s place in the series. She’s voiced by Momo Asakura, who also has performed as Charlotte‘s Ayumi Otosaka, Koharu Shirahane of Kuromukuro and High School Fleet‘s Mikan Irako. I was originally intending to write about Charlotte but after procrastinating, lost the resolve to do so, while for Kuromukuro, I never found a strong theme in the series that motivated me to write about it. Introducing Rona into Endro! 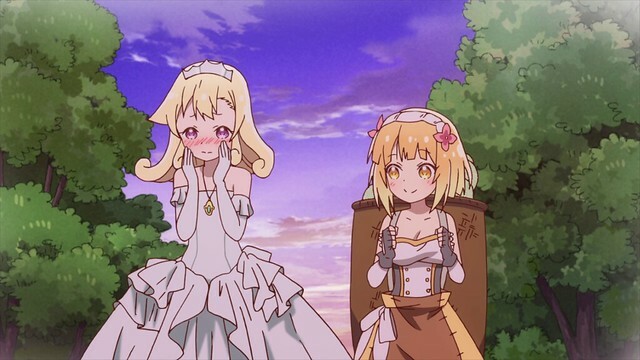 meant being able to explore character dynamics that are typically left to second seasons: when Rona desires to know Yūsha’s friends better, she accompanies them on their usual activities. 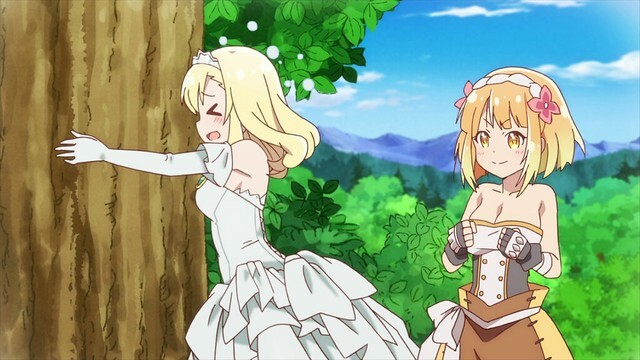 Seira and Mei are a bit duller, but Fai’s wilderness excursions creates an opportunity to learn more about Fai; up until now, all viewers know of Fai is that she excels at close-quarters combat and loves food. As it turns out, Fai is from the wilderness and as such, has unparalleled survival skills: her navigational abilities in the forest are exceptional, as is her resourcefulness in making use of natural implements for survival. 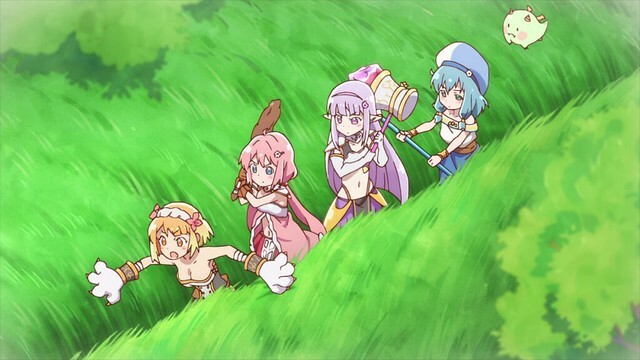 Endro!‘s wild run means that it has a bit of everything in it, and this ends up giving viewers a much deeper insight into Fai’s character well beyond food. Until this point, both Seira and Mei have been characterised; Seria is booksmart and is nearsighted, while Mei simply loves Cartado and will not hesitate to gush about its applications and history. While Rona may not like melons, she takes one for the team to help Fai win an eating contest. While she may have appetite that is nearly insatiable, this episode shows that even Fai has her limits. The soundtrack for Endro! is quite nice, capturing both the fantasy setting motifs as well as everyday life for Yūsha and her friends. I have not found a tracklist or release date for the soundtrack and surmise that any music will probably be released with the Blu-Rays. When Rona wishes to see Yūsha do heroic things, Mao helps her setup a ploy that entails creating a “fake” Dæmon Lord for Yūsha to fight after Rona “convinces” her to do so. Unbeknownst to her, Mao is actually the Dæmon Lord, and after realising that screwing with Yūsha and her friends could result in a time loop manifesting again, Mao decides to live life peacefully as a teacher. On her first day as a student, Rona’s words to Mao frightens the latter, who wonders if Rona’s secretly figured out her background. 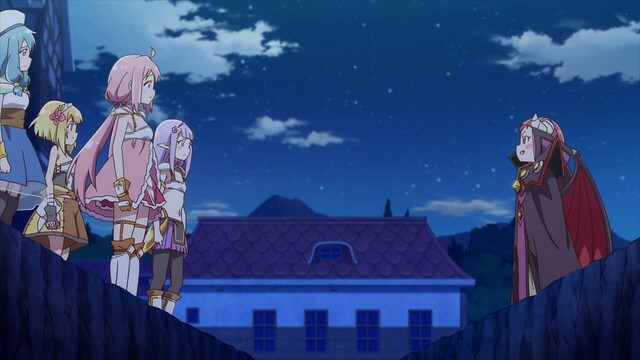 Yūsha is frequently counted as being quite unheroic in manner and appearance: her resemblance to Yuru Camp△‘s Nadeshiko Kagamihara is probably deliberate, and the manga, serialised in Comic Fire, began its run in August 2018. That Endro! 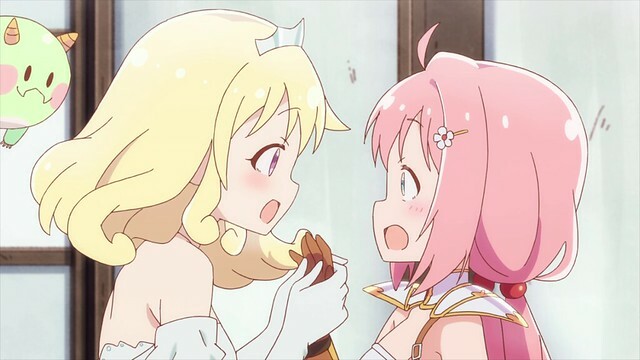 has characters resembling other Manga Time Kirara characters, in conjunction to its timing, suggests that author Izumi Minami may have drawn on familiar characters to see how a mish-mash of them in a different setting might fare. The answer is simple enough: Endro! works and is very enjoyable. When Mei learns from Tarka that she’s been invited to a Tarka Cartado Festival, she’s enthralled: it’s the equivalent to being invited to Apple’s WWDC or Facebook’s F8 conference, and therefore difficult to get in. Yūsha, Seira and Fai immediately take a liking to the Tarka, and he allows them to join in, as well. When the girls arrive in the Tarka’s world, they find Cartado literally growing on trees; the Tarka guiding them says it’s alright for the girls to grab a few, and it takes Fai’s full efforts to restrain an ecstatic Mei from going wild. Endro! 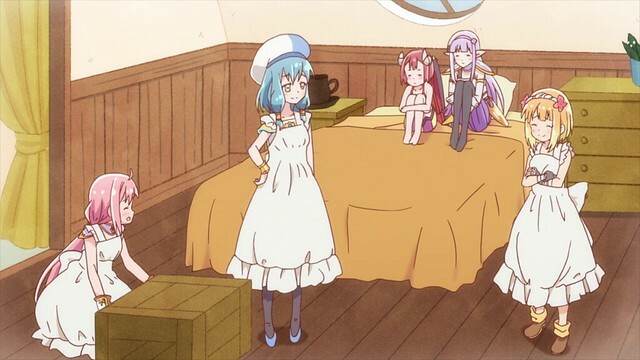 is highly disciplined with its fanservice moments; the girls changing into Tarka clothing is one of them, and Seira is made the subject of another joke when her flat features means that she fits into her initial outfit without any issue. Mei’s similarities to GochiUsa‘s Chino Kafuu stem entirely from the fact that she’s voiced by Inori Minase, and for me, every one of Mei’s lines reminded me of Chino. The similarities end briefly whenever Mei is excited by Cartado, but this is no less endearing. The aim of the Cartado hunt is to find wild Cartado of high rarity; the girls’ search prove quite fruitless, and when they locate a legendary rare (which I imagine would be equivalent to the exotics from The Division), it slips through their fingers. While Mei had been intent on finding one, she feels that just by being at the Cartado Festival, she’s experienced something marvelous and chooses to make the most of it. Mei looks thoroughly unimpressed with the large Cartado that they find here, as it’s a mere common, but Seira, Fai and Yūsha are impressed, having never seen one that large before. This is enough to win the competition, and the Tarka running the show shares this remark. The Tarka burn the Cartado at the end of the festival, leaving Mei torn: she is sad to see Cartado go up in smoke, but also accepts that Cartado has a very clear tradition that must be respected. 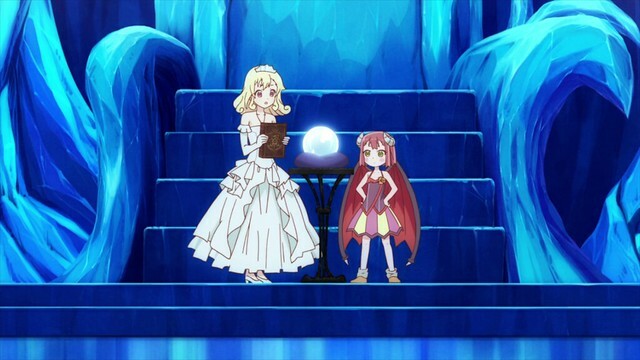 The tenth episode was focused purely on Seira going into everyone’s dreams to save them from being lost on their own fantasies and freezing to death amidst a snowstorm. Her stubborn will turns out to be an asset: she knows that she’s unlikely to maintain a clean room or have a full figure and is able to overcome the spell that a Cartado-eating monster placed on everyone, whereas everyone else succumbed to their fantasies. After the girls defeat a griffon in a field, they feel as though they’ve improved. Despite the progress they’ve made, they still appear quite weak compared to full-fledged adventurers. 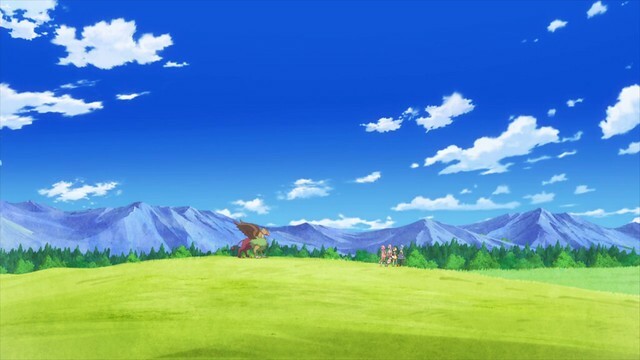 This moment captures the sort of scenery that is typical to Endro! : the art and animation are nothing remarkable, but it’s also very clean and smooth. The girls bring news of this quest back to Mao and ask for a more difficult challenge, but Mao declines. Endro! makes extensive use of exaggerated facial expressions for effect: when all four characters have the same face, it signifies a unified sense of whatever the moment calls for. This leads to some particularly enjoyable moments, such as when the girls react to Mao here with the exact same faces, recall their old memories from Rona’s Cartado or hear Seira’s rather unexpected suggestion of using Meigo as a hostage to bring the Dæmon Lord out. Endro! 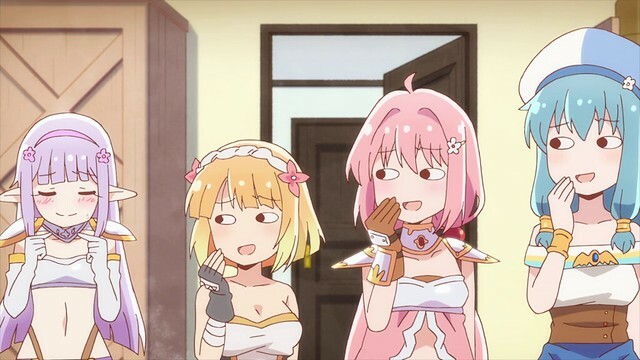 has the best funny faces I’ve seen of any recent anime. While I was writing this talk on Endro!, the Calgary Flames prevailed over the San Jose Sharks 5-3, with goals from Mikael Backlund, Michael Frolik, Mark Jankowski, Sean Monahan and Dalton Prout. Johnny Gaudreau netted two assists, and goaltender Mike Smith had a relatively easy evening, making 12 saves. Three of our goals came within two minutes of the first period, and with this win, the Calgary Flames have won the Division title for the first time in thirteen years, and have also clinched the conference title, as well. This is superbly exciting – we will be starting the playoffs with home ice advantage. 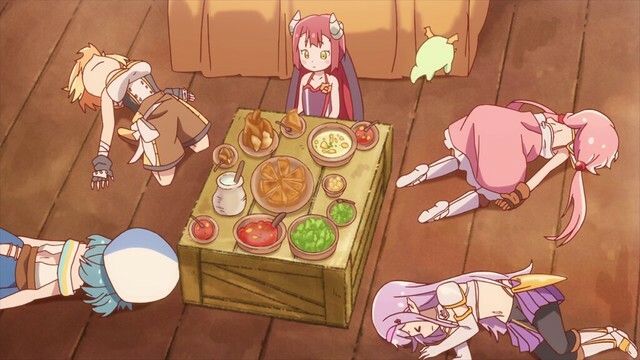 Unlike Bender’s cooking in Futurama, which looks as awful as it tastes, Mao’s cooking looks quite nice but manages to put everyone, even Fai, on the floor. Lethal cooking is a commonly employed humour device in fiction: anime typically employs the effect a poorly-cooked meal has on individuals, although I hold that employing visual humour to indicate the cooking’s lack of edibility, is also effective; in Futurama, Bender drops a tray of “drinks” that melt a hole in the floor, showing that stuff like that has no place in a stomach. Even Chibi-chan regurgitates its stomach’s contents: because Chibi-chan is a higher-dimensional being, its stomach is a pocket universe with unusual properties. 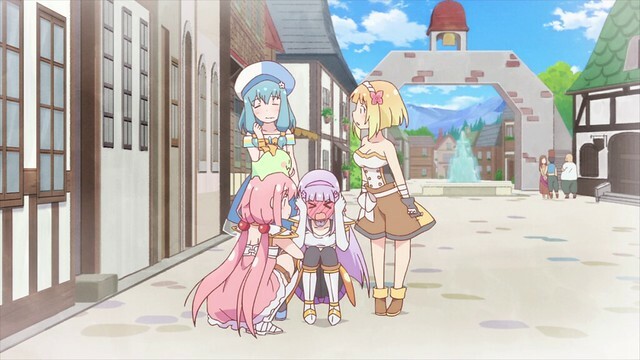 This is employed as comedy early on, but will later serve a more important purpose in creating Endro!‘s ending. 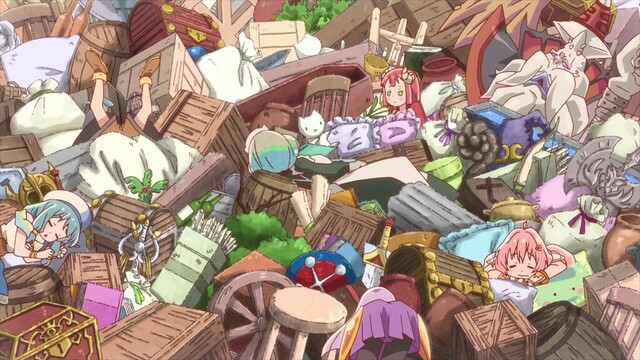 Like a game of Where’s Waldo, I invite readers to find all of the characters amongst the mess, which is probably one of the more detailed moments in Endro! that leads me to wonder if Studio Gukomi expended a sizeable chunk of their budget in creating such a scene. Meigo is a name of Yūsha’s invention, a portemateau of Maid and Golem; Mao’s golem was created to serve her and proved to be an exceptionally effective servant, but somehow ended up in Chibi-chan’s pocket universe. After returning to this world, Mao decides to look after Meigo primarily out of fear that she may accidentally be exposed as the Dæmon Lord, but also finds Meigo’s autonomy a little unusual. In the end, when Rona appears to try and restore Meigo’s memories, she successfully brings back the memories that Yūsha, Seira, Fai and Mei lost after their botched spell. Meigo’s memories are also restored, but she chooses to keep them close and keep Mao safe. Rona suggests taking Meigo back with her, but Mao draws the line here, transforming into the Dæmon Lord and taking Rona back to her castle. The girls are shocked at this revelation and find themselves at a loss for what their next move is. The female knight instructor with a clear-and-present crush on Mao appears, giving the girls a Cartado to find Mao. As they make their way to Mao’s castle, Mao is shown chilling in her usual manner: it turns out that her child-like avatar is her native form, and that she takes on the appearance of a male dæmon purely for theatricality’s reason. 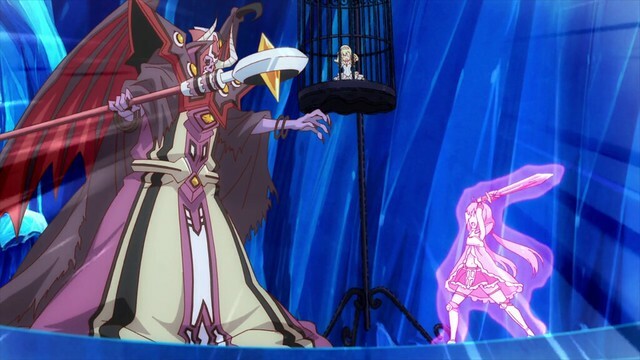 Even in this form, Endro! never comes across as being dark, grim or intimidating. Upon arrival, Meigo informs the girls of the story: after nine hundred and ninety eight resurrections, the opportunity to take out Mao for good is at hand, and that even with their lack of experience, Mao’s been weakened with the constant resurrections. This information leaves Yūsha at a crossroad: she’s become fond of Mao as their instructor and cannot bring herself to fight a friend even if the world hangs in the balance. 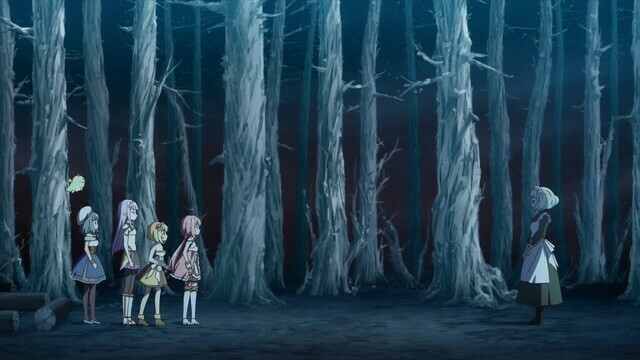 The girls decide to return to the school and figure out why’d they chosen this path to begin with. 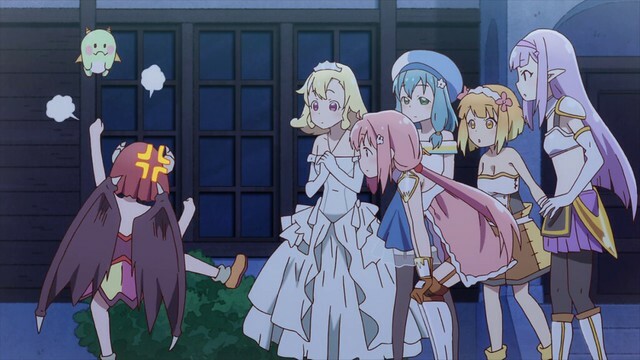 This is easily the most serious moment in Endro!, but even then, audiences are left with no doubts as what will happen next. Meanwhile, Mao is frustrated at the turn of events and decides to go back to the school to meet her destiny, having grown tired of being alone: as a teacher, she was able to experience the joys of imparting knowledge and the company of others. Feeling that this is preferable to becoming a fully-powered Dæmon Lord, she asks Yūsha to finish it. 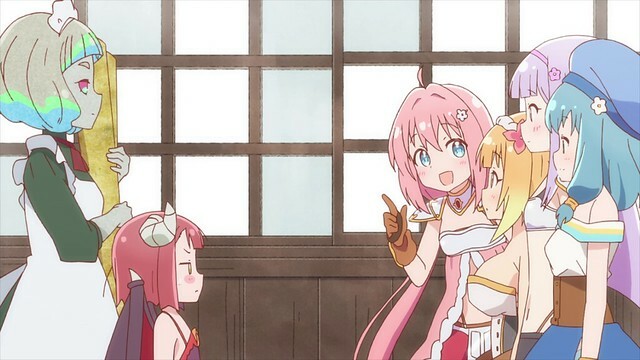 Making tough choices and being put on the spot, however, is not how Endro! rolls, and when Yūsha decides to take a third option, it stuns everyone. After it is explained to her that deliberately casting aside the hero means allowing Mao to resurrect fully again, Yūsha recoils in horror. However, this is not the end: Meigo chucks Mao into Chibi-chan’s waiting maw. Moments later, she is promptly spat out. As it turns out, Chibi-chan is actually a three-dimensional representation of abstract, high-dimension dragons; when Yūsha used the time spell, it drew the spirits’ attention. Meigo entered the space inside Chibi-chan and lost her golem attributes. 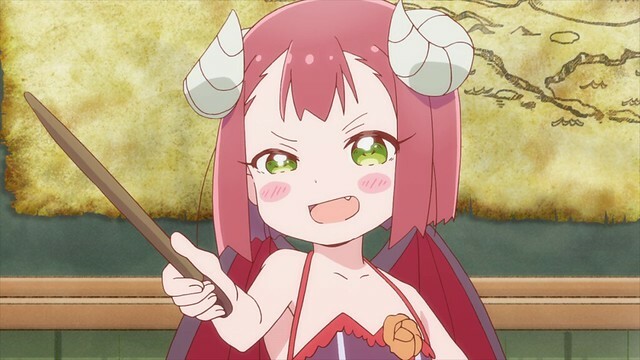 Realising this, she acted with the knowledge that having Chibi-chan “eat” Mao would also clean her of her Dæmon Lord powers. 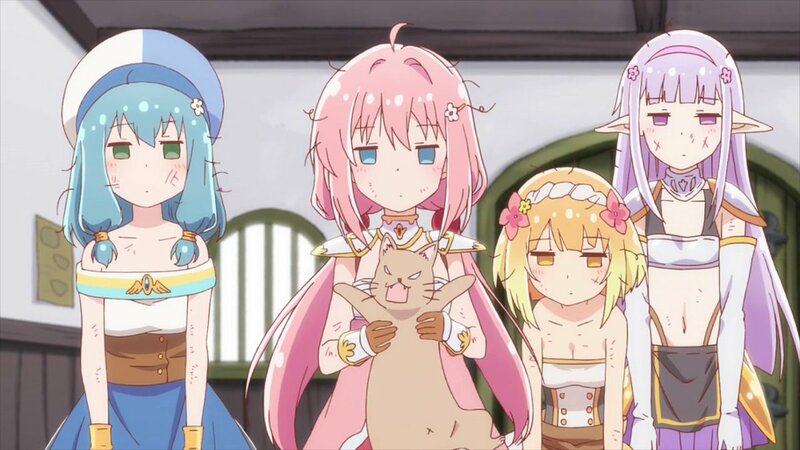 The end result is hilarious, and also creates a conclusion befitting of Endro!. The page quote is drawn from Avengers: Infinity War, referring to Loki’s fate after Thanos kills him, but is applicable here in Endro!, as well: with Mao’s Dæmon Lord powers gone, there’s no chance that a Dæmon Lord could appear again. In the end, Endro! merits an A grade simply because it was consistently entertaining each and every week. 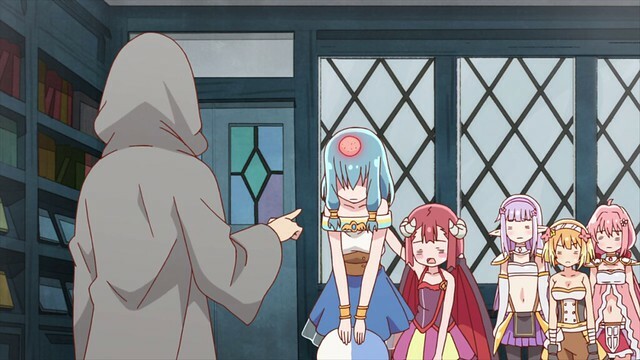 Not all anime need to have world-changing themes or high-tier artwork to be worth watching, and while Endro! initially looked to be something that I imagined I would enjoy somewhat, it ended up exceeding expectations. Endro! ended up being the only anime I had any inclination to write about this season owing to how busy it’s been. Having wrapped up this post on Endro!, I enter the spring season with my eyes on Strike Witches 501 Butai Hasshinshimasu (Strike Witches, 501st Unit Launching!). This series will consist of shorter episodes spanning some 15 minutes each, and I will be writing about it in some capacity. I’m not too sure what other shows in the upcoming season I will be watching just yet and will have a better idea of what my schedule will look like a few weeks into April. Aside from a positive theme, Endro!‘s greatest strength lies within its setting and how the characters interact with this setting. 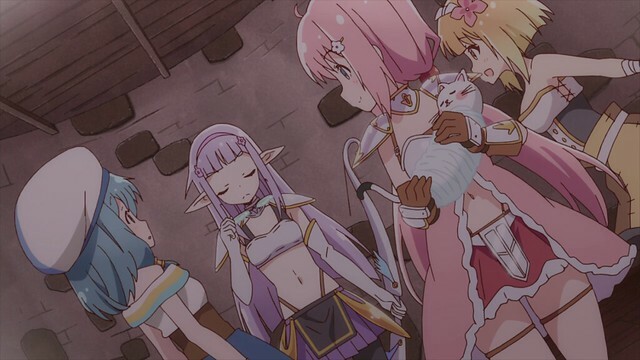 Whereas a number of series in a fantasy setting tend to feature characters from another life, Endro! treats its world as a self-contained entity whose inhabitants reside there without having any connections to previous lives in alternate universes. As a fantasy world, Naral Island plays host to monsters, settings and phenomenon that accommodate wild adventures, but because Yūsha and the others are fully immersed in their world, they are free to experience (and square off against) its various aspects in a natural way. While Endro! 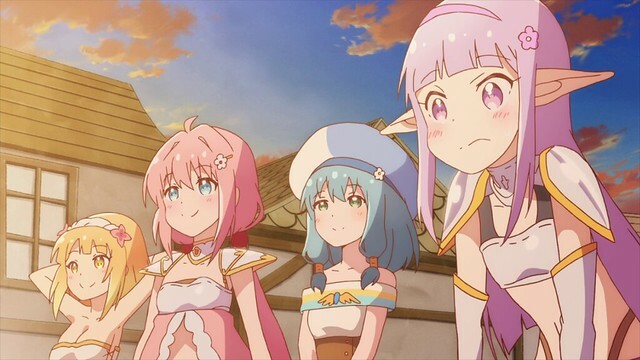 may have chosen to take a slice-of-life approach, anime of different genres can do well to follow Endro!‘s example and return to their roots, forgoing past lives in favour of creating individuals who were born and raised entirely in a fantastical setting. This results in experiences and adventures that are much more authentic and genuine, strengthening the messages a series can convey. With Endro! now over, and the threat of the Dæmon Lord removed permanently, Endro! 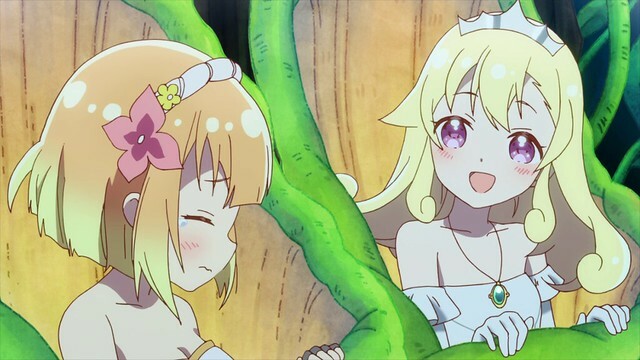 comes to a decisive conclusion: I find it difficult to suppose that there could be a continuation because of how well loose ends are wrapped up, but if there ever were to be a continuation, I would not have any qualms in following Endro! again. 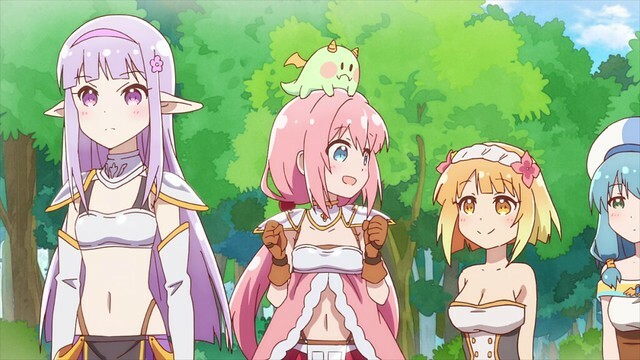 This is a series for folks who enjoy series such as those from Manga Time Kirara; Endro! applies the setup here and utilises the fantasy setting to create unique, but adorable sequences that are a breath of fresh air. Yūsha is a hero who resides on the island of Naral: she is the latest in a generation of Heroes, whose duty is to defeat the ancient evil known as the Dæmon Lord, whenever one appears. 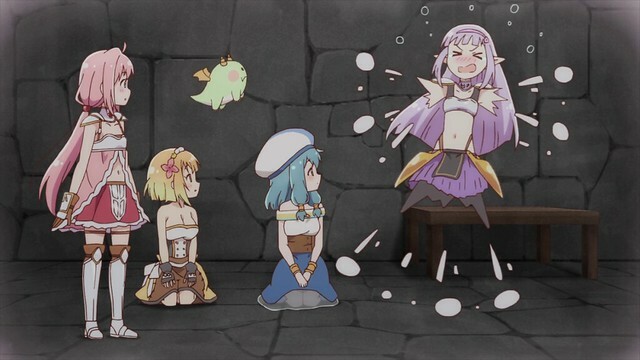 When she and her friends, Seira, Fai and Mei use a spell to seal away the Dæmon Lord, an accident occurs that sends the Dæmon Lord backwards in time. 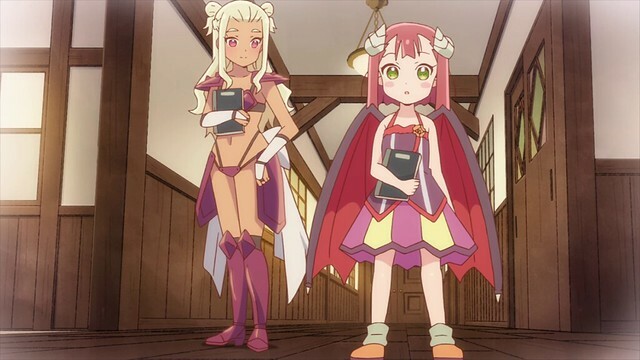 Manifesting as a small girl, the Dæmon Lord Mao decides to work as a teacher at the Adventurer’s School with the aim of preventing Yūsha from reaching her potential as a hero in the future. Her first attempt as a teacher is to rig a simple assignment and send them down the wrong path with the goal of forcing their expulsion, but Yūsha and her company return with the Hero’s Sword. 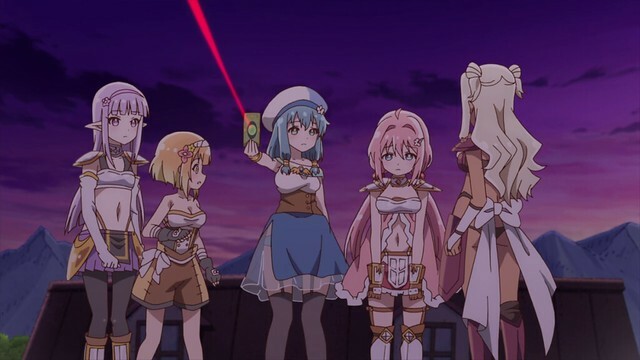 Later, Mao learns of the girls’ unique talents (Seira is well-read, Fai is a capable fighter, Mei excels with Cartado and Yūsha’s luck is unmatched), and decides to throw the group into chaos by asking them to elect a leader. The girls struggle to decide who should lead their party, and after failed attempts to find one leader, decide that they can lead one another as the situation calls for it. Mao realises that history may repeat, and consigns herself to living a normal life. When the girls begin their practical for finishing assignments, they are somehow assigned to locating cats. They later receive a quest for retrieval, but end up detouring to help a little girl find a lost cat, defeating a stronger arachnid to do so. In their excitement, they forget to pick up the herb they were originally set to retrieve. This is Endro! (End Roll!) after three episodes, a fantasy anime drawing elements from slice-of-life series that has proven to be surprisingly enjoyable for the various misadventures Yūsha and wind up becoming entangled in as they explore their world. 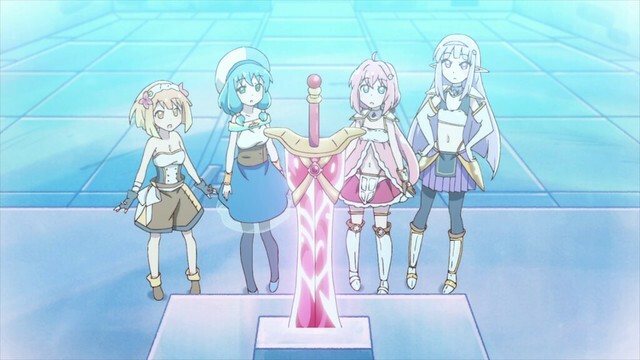 By this point in time, the notion of “alternate worlds” (isekai) anime are one that has been the subject of no small discussion among the community; isekai stories are characterised by a high fantasy, RPG-like setting where a protagonist may have recollections of a past life; the typical isekai series has a protagonist whose capabilities in their original world were limited or otherwise unappreciated, and in this new world, their profound knowledge of things one might consider to be trivial (e.g. RPG mechanics, high fantasy tropes, etc.) allow them to find success. It’s a genre whose popularity is such that there are presently no shortage of such series (mirroring the fad in battle royale games), and so, the surge of isekai series means that commonalities between different series are manifesting now to render different series unremarkable. 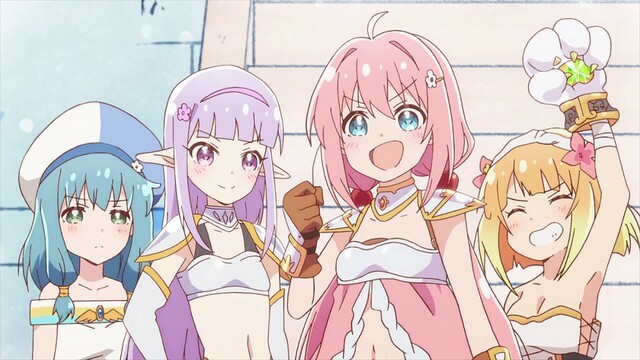 Endro!, on the other hand, might be set in a fantasy setting where RPG mechanics are present, but the series has not displayed any traits found in other isekai series (for one, wish fulfillment in the form of an uncommonly powerful protagonist with recollections of life in another world). Instead, Endro! focuses on Yūsha and her friends’ blissful everyday lives as they train for the eventual challenge of defeating the Dæmon Lord. 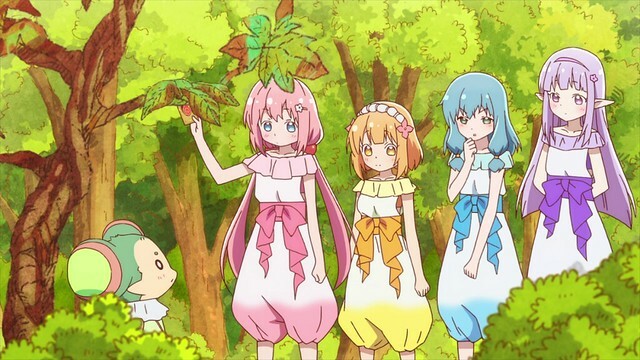 Things more common to slice-of-life come into play, with the end result being a fluffy and humourous series that, despite drawing so many elements from well-established genres, manages to come across as being quite original and exciting to watch. Endro! 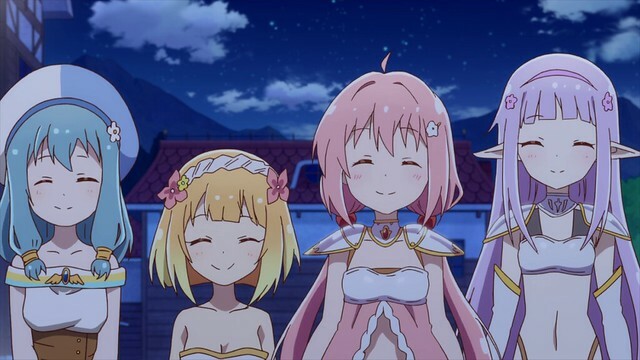 is not a Manga Time Kirara series (the manga was serialised to Comic Fire), but it does appear to be one prima facie: Yūsha resembles Yuru Camp△‘s Nadeshiko and is voiced by Hikaru Akao (Comic Girls‘ very own Kaoruko), and Seira looks somewhat like Aoba from New Game. Mei is voiced by Inori Minase, who delivers her lines a great deal like GochiUsa‘s Chino Kafuu, while Fai looks like Koyume from Comic Girls. While one might imagine that following the outcome of Yūsha’s triumph over Mao, she’s enjoying a well-deserved sleep, it turns out that we’re now back in a period before Yūsha had even become a hero. Mao is transformed into a small girl and decides to stop Yūsha from defeating her by expeling her from the Adventurer’s School. The notion of endless, looped time was previously explored in The World in Colours, and the simplistic usage left some disappointed. In Endro!, it’s a bit early to tell what impact Yūsha’s failed forbidden technique has on causality. While a monsterous being modelled after classic anime villians before, Mao becomes a small girl with dæmon horns after being sent back in time. As the teacher for Yūsha’s class, she proves to be knowledgeable on the world, but secretly schemes to prevent Yūsha from ever reach the point where she could challenge her. This suggests that Mao’s capacity for evil is likely matched by her ability to know what goes down in Naral. 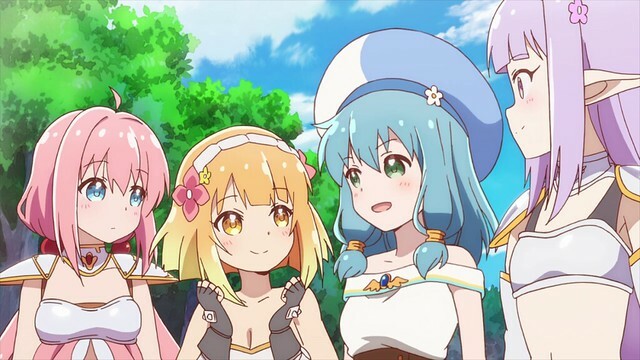 Seeing Aoba, Nadeshiko, Koyume and Chino in a fantasy world was sufficient to convince me to give Endro! 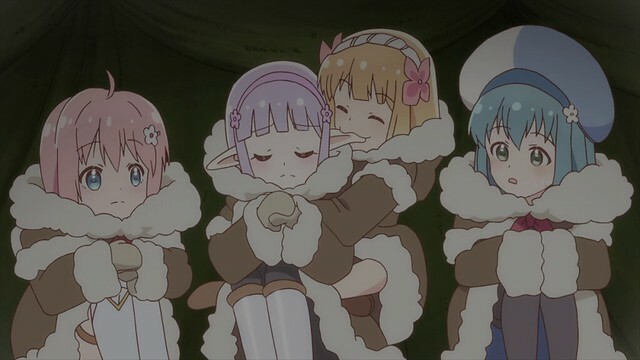 a go for blog posts: as the winter 2019 season started, I was intending to wait and see to pick any anime to write about, since changes in my schedule mean I can no longer write with the same frequency as I used to. As such, I would prefer to only write about series where I might be able to say something useful, amusing or both. Mao’s insidious plan involves doing whatever it takes to expel Yūsha using her position as a teacher; she is able to control the nature of the assignments and exams, but also manipulate some aspects of reality to send the girls astray. However, Yūsha’s luck as a hero and her indefatigable spirit means that she somehow manages to find a way through. 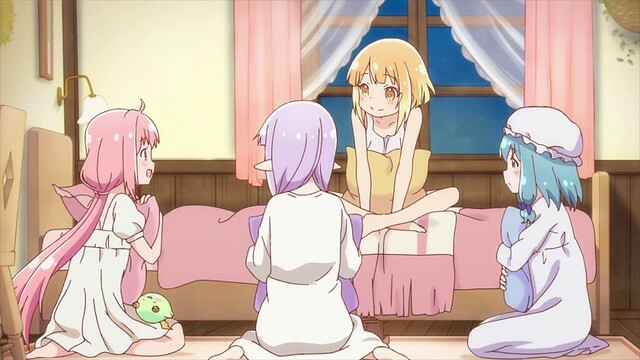 Besides their outward resemblance to other Manga Time Kirara characters, each of the girls have a unique trait: Seira has a fixation on horned gorillas, Fai’s mind never strays far from food, and Mei lives for Cartado. Whenever topics allow the girls to express their interests, they tend to delve into a long-winded talk that leaves the others flummoxed. RPG elements in Endro! are present in all but name; everything seen in RPG games are available, including notions of levelling, looting and questing. However, Endro! gives no signs of being an RPG: the characters seem to be a natural part of their world rather than experiencing it with an external perspective. As such, viewers are free to focus on the humour and character dynamics, rather than attempt to work out game-like mechanics or rules. 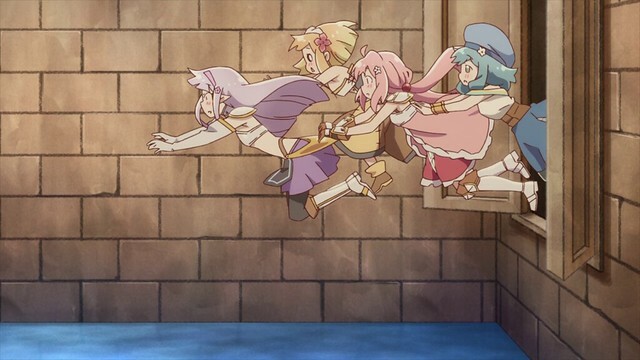 When the girls get caught in a dungeon with seemingly no chance of escape, Seira throws an adorable fit. I haven’t seen very many series where the “arms and legs become reduced to simple geometric shapes”, so it is always quite entertaining to see this go down in what Cantonese people call 扭計 (jyutping nau2 gai3, literally “to kick up a fuss”). When Endro! was close to airing, I heard speculation that the series could go grimdark very quickly, given that Studio Gokumi’s last work with heroes had the heroes languish in despair as they discovered the truth about the world. After one episode, it is clear that there will be none of this, and this works to Endo!‘s favour. Yūsha manages to somehow free the girls, finds the Sword of the Hero (two-handed, binds on pick up, confers +150 strength and +150 stamina, and on attack, has a chance to deal massive damage against all opponents, ignoring resistances, etc), picks it up against Seira’s suggestion and promptly uses it to defeat a golem guarding the sword. However, unaccustomed to its power, Yūsha inadvertently destroys the dungeon they were originally supposed to be in. Besides being party members, Yūsha, Seira, Fai and Mei are friends, as well. During their down time after hours, they spend many evenings having various conversations, with the effect that Yūsha sometimes falls short on sleep and dozes off during class, to Mao’s simultaneous displeasure and pleasure (for disrupting class, and for increasing her odds of being tossed from the Adventurer’s School). Despite their eccentricities, each of the girls in Yūsha’s group have their own unique talents, and Mao is quick to recognise this. While it sounds juvenile for me to say so, this was the magic moment for me in Endro! 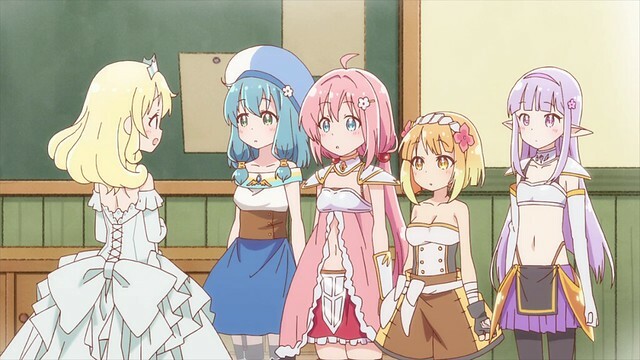 : while trying to work out who should be leader, the girls decide to test each individual, and here, Seira is embarrassed to admit that she’s not much in the way of “leading by example”. Fai, Yūsha and Mei’s eyes here are a riot, bringing to mind the cut‘s eyes from Girls’ Last Tour. So out of place and distinct the Eyes of Disdain are, I hesitate not in saying if the whole of Endro! was to be rendered this way, I would still watch it. From here on out, Endro! has established beyond any doubt that it is a fun series to watch. Yūsha fails as a leader for being too bold and for charging into a situation without assessing her surroundings, while Fai lacks the will to lead a team owing to her preoccupation with food. Chino Mei ends up pushing the team to camp out overnight to be first in line for a new card. The girls eventually take a third option, opting to simultaneously lead one another, showing their resourcefulness and ability to employ the sort of creative thinking needed to best a Dæmon Lord. Mao concludes that if she were to allow Yūsha and the others to mount an assault on her as they are now, their incomplete mastery of the time magic would result in her suffering the same fate as Dormammu: the heroes and Mao would be trapped in this moment, endlessly. Realising that this would essentially make her Yūsha’s prisoner, she decides to simply live in the moment. There’s a Doctor Strange reference here for the readers who are MCU fans, and I should note that it should be no surprise I am hyped about both Captain Marvel and Avengers: Endgame. After rolling a second consecutive quest where their goal is to find a cat, the girls become determined to get a proper retrieval assignment after recalling the brutally difficult effort it took to find a cat. Ho exceedingly efficient in their task. Yūsha has an unusual talent for rolling stacks, and they get five more cat retrieval assignment, becoming exceedingly efficient in the process. Thus, they cannot believe that they’ve gotten a real assignment on their third day, and set about finding some herb. When a little girl approaches them and asks about her cat, Yūsha and the others decide to take up the search as a side-quest of sorts. The girls follow a trail of tips from townsfolk into the woods, defeat an arachnid-type monster and secure the herb per their assignment. 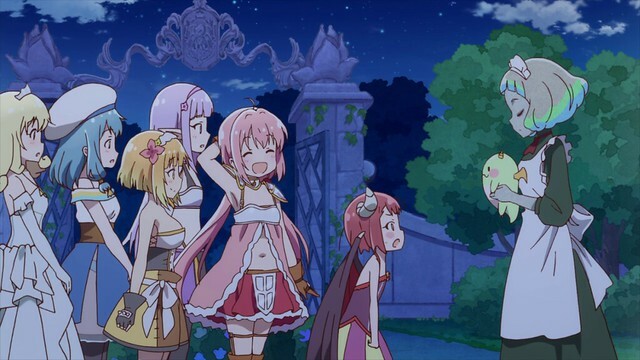 As darkness falls, they decide to set up camp, and Seira realises she’s forgotten to bring food. An irate and semi-delirious Fai begins munching on Seira’s ears, her go-to reaction when food is unavailable, forcing Yūsha to return to town for provisions. The next morning, Seira’s ears are noticeably worse for wear, and she resolves to never forget the food again on pain of having her ears worn down by a ravenous Fai. A year ago, we would have been three episodes into Yuru Camp△, and was quickly proving to be one of the most enjoyable anime of the season. 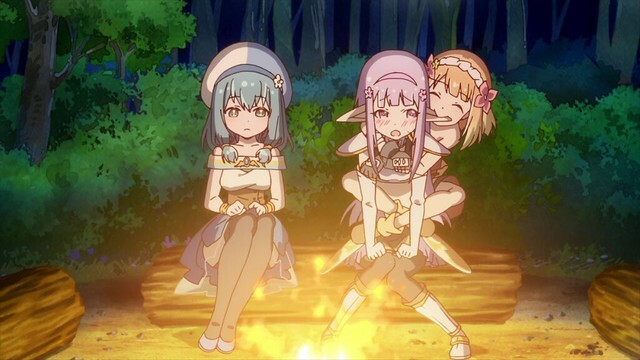 While there’s a bit of camping in Endro!, it’s nowhere near as comprehensive as what’s see in Yuru Camp△. As such, I will not be doing any comparisons between Survivorman and Endro! today. The page quote today comes from The Unexpected Journey, when Bilbo is declining Gandalf’s invitation to help him with an adventure. 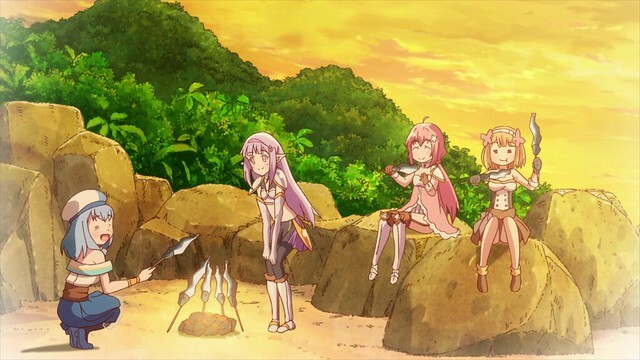 Hobbits are known for their love of food and a simple life: I’m certain that Seira is feeling this way now: while Yūsha and the others are no stranger to adventure, missing dinner is something that Fai simply won’t tolerate, and Seira’s ears pay the price for her oversight. A little-known fact about me is that I will become as unreasonable as Fai if I miss a meal. We’re approaching the Chinese New Year now, and that means family dinners to welcome the Year of the Boar. Earlier today, we had the first of our dinners at one of the best Chinese restaurants this side of time. Among the things on the menu were fried cod, fried shrimps, birds’ nest sirloin, pork collar and snow pea shoots (in addition to fried tofu, yi mein, fried rice and crispy chicken): Cantonese cuisine may not look it, but it certainly can leave one feeling quite warm on a chilly winter night. I’d woken up to thunder, of all things, this morning, and the entire day was a blustery one. The next morning, Yūsha and the others arrive at a tower, whose attendant states that yes, a cat matching their description is to be found inside. Upon entering, the girls find plenty of traps and monsters awaiting them. Rather than fighting their way to the top, Yūsha somehow manages to find shortcut that leads them to the top. Here, they square off against an elite arachnid, and Mei notes the difficulty of the battle, correlating the colour of a monster to its difficulty. I am reminded of The Division, where different health bar colours on enemies indicate their difficulty. Red health bars are normal, purple enemies are tougher, elites have a mustard-yellow bar, and then named elites have bright yellow bars. When I started out, anyone tougher than a purple would take me a while to beat, and groups of elites would overwhelm me. Having sunk nearly two hundred hours into The Division, and acquired a full six-piece Classified Striker Set, plus every exotic in the game and excellent weapons, even named elites fall before me, and it is only in legendary missions where my character becomes inadequate when solo. Back in Endro!, after the girls beat the arachnid, they find the cat stuck on the roof. It turns out that Seira is indeed a good archer, but dislikes wearing glasses for fear of being counted as a bookworm. With another assignment completed successfully, Yūsha and company return the girl’s cat. However, they end up forgetting their original assignment and immediately depart to retrieve the heart-shaped herb they were supposed to be securing. Endro! surprisingly exceeds expectations, and after three episodes, I see an anime I could relax to every Saturday for the next season, which is a busy one. I purchased Ace Combat 7: Skies Unknown yesterday and have every intention of experiencing Ace Combat on the PC. In conjunction with this, Battlefield V‘s Tides of War assignments are keeping me busy, and The Division 2‘s open beta is set to open on the seventh of February. Owing to the number of things to do, I likely will be writing about one more anime this season, and The Magnificent Kotobuki is probably the one other show to be accorded this. For both Endro! and The Magnificent Kotobuki, I will return to do whole-season reviews after the three-episode post, and in the interim, I will be writing a great deal more about games. For those who are here for my anime discussions, fear not: I also intend to look at Mirai no Mirai and Non Non Biyori Vacation in the upcoming months! Endro! is so-called because of its premise: the series’ outcome is preordained and already known to viewers within the first five minutes. After Yūsha and her friends destroy Dæmon Lord, the end credits roll. 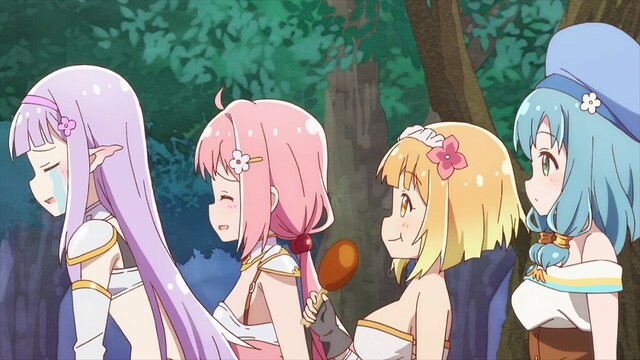 However, while audiences know what the end results of Endro! are, there remains the question of how Yūsha and the others get to this point. 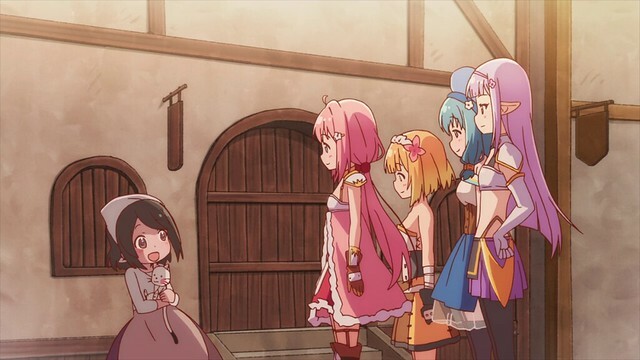 This is a very clever way to remind viewers that the journey is more relevant than the destination, and so, when audiences see Endro!, they know that every choice and experience Yūsha and her friends make and have will contribute to the ending in some fashion. This particular approach is what makes films like First Man and Apollo 13 so enjoyable: audiences enter knowing that Neil Armstrong successfully lands on the moon and will become the first human to walk on the surface of another world, and similarly, that Jim Lovell and his crew would successfully return to the earth after an explosion in the Apollo space craft forced them to abort their landing on the moon. In both cases, the journey, seeing how the outcome was reached, matters more than the outcome, and Endro! 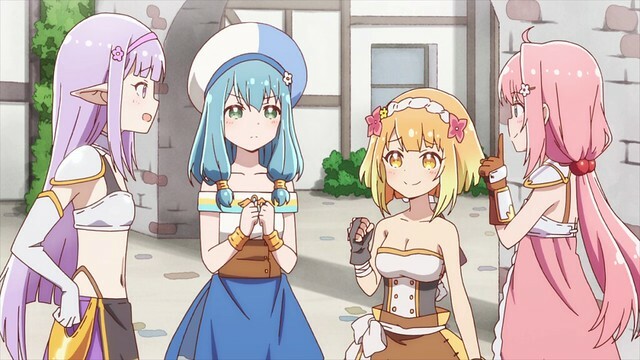 is using the very same approach to set the precedence for viewers as to what happens; viewers come in with the knowledge that this series in a fantasy realm is going to be comedic, easy-going and light-hearted, which is a welcome departure from the darker and more serious atmosphere that some isekai anime convey.